Tag Archives: For the curious: What is GBCAT? For the curious: What is GBCAT? 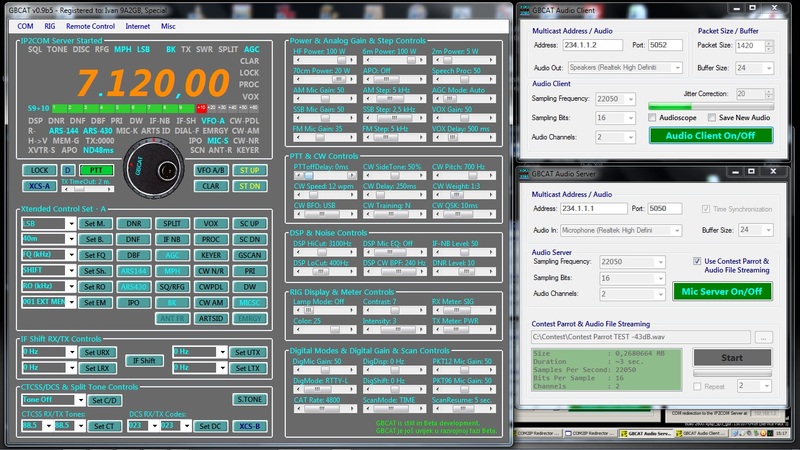 GBCAT is PC software for controlling amateur radio devices through a COM/USB port or through a TCP/IP network, with the ability to transfer a 2-way audio signal over a TCP/IP network. GBCAT is composed of three parts: the base module, the extended command set A, and the extended command set B. In the registered version, all modules retain their functions, regardless of whether they are displayed on the screen or not. The GBCAT installation package also contains: an integrated Remote Desktop Connection, an IPCOM Server/COM2IP Redirector, and an Audio Server/Client. A PC powered by a single core processor, (recommended CPU clock is 1.7 GHz or higher), 2 MB RAM, a COM or USB port (USB to COM adapter if required), TCP/IP network card (for wired or wireless operation), and any of the supported radios connected to the COM port by a suitable cable/adapter and powered on. GBCAT development has been ongoing for two years, and takes all of the author’s free time; nevertheless, GBCAT is free of charge. More in GBCAT help files in English, Italian or in Croatian language. You may download any of documents here, in PDF file format, as well as the GBCAT installation package.